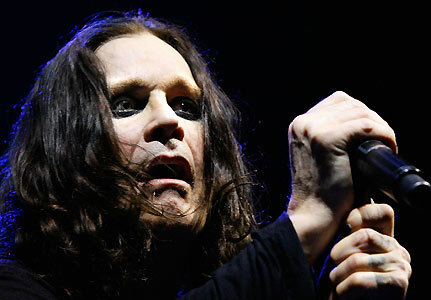 In the most ironic attack in recent memory, a 500-pound bat attacked Black Sabbath vocalist Ozzy Osbourne, severing his head clean off of his body during a show last night in Los Angeles. Black Sabbath, the metal band formerly fronted by metal legend Tony Martin, were performing the song “Headless Cross” when Ozzy was accosted and decapitated by the bat. The bat, a mutant Eastern Tubenose indigenous to the Three Mile Island region of Pennsylvania, scrawled out the word “REVENGE” in Ozzy’s blood on the stage immediately after the attack. Police quickly apprehended the bat and are holding him in a steel box on 1 million dollars bail at Lompoc Federal Prison. The bat’s attorney Ken “Iron Head” Murphy has said that the bat will not make any comments until his 5 PM press conference tomorrow afternoon. However, a police officer who interrogated the bat claims that he bit off Ozzy’s head accidentally, thinking it was made of plastic. Miraculously, in spite of no longer having a head, Ozzy is in excellent condition. He was unable to finish the concert, but has said he will solider on and not miss any other show dates. He was even seen playing touch football in the hospital courtyard with members of the band One Direction and former Falcon Crest Star Lorenzo Lamas. “I can’t said miss eleven quarter horse the whole enchilada, you know. On stage is where I glumfer and would never become a gorilla, at least not on purpose,” slurred Ozzy through a hole in his neck to a crowd of reporters outside of his hospital room. Rumors have begun to swirl about a potential connection between the bat and Al-Qaeda. Supposedly, the bat had contacted other bats in a local cave about starting a “bat jihad” against infidels and vampire novelists who have been creating and enforcing negative stereotypes their species. 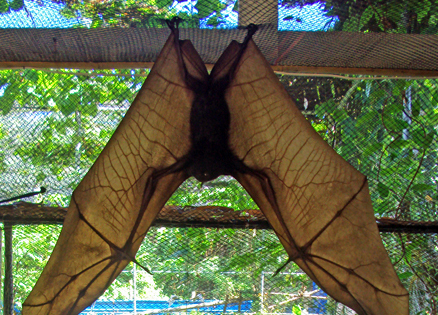 The bat was carrying a journal at the time of his arrest that listed plans to carry out several attacks against high profile celebrities including Stephanie Meyer, author of the Twilight books, former Batman star Adam West and musician Meatloaf, who is best known for his bat-sploitation album “Bat Out of Hell”. Meanwhile in Washington, several conservative talk radio hosts and Republican Congressmen have criticized President Obama for not referring to the bat beheading as a terrorist attack and immediately invading Transylvania. Obama’s response has instead been a more measured approach, authorizing Predator drone strikes on caves and belfries that harbor bats that might or might not be linked to terrorism. This entry was posted on April 30, 2013, 7:16 AM and is filed under General Weirdness. You can follow any responses to this entry through RSS 2.0. You can leave a response, or trackback from your own site. My word of the day: Bat-sploitation. I will try to use it no less than three times in random convos at work today. I’ll let you know of my progress. Fail… I forced it once, it didn’t fit well into the convo I was having with a colleague about Tony Parker’s dominance over the Lakers. Well, you gave it your best shot. And that’s what counts. I’m sorry, but this story is entirely unbelievable. I think that Ozzy’s shuffling gait caused by his advanced Parkinsonism would preclude him from engaging in touch football. He would be placed on the geriatrics ward, put on a minced diet, his only exercise would be physical therapy and at all other times he would be locked in a Geri-chair to prevent wandering. HA!! I’d pay good money to see that. I’m astounded you were able to transcribe that much of Ozzy’s speech. You must come from a long line of skilled court reporters. I listened to the tape about 25 times to get the quote. It wasn’t easy. Finally Ozzy got what he deserved. Not an eye for eye, but a a head for a head. I’ve said it before: there can’t be a story about Ozzy without a beheaded bat. Or the other way round at least. Just read a report in Pravda that Ozzy’s head is also doing fine, and that the doctor assigned to the case, a Dr. Sergei Bryukhonenko believes that the head will soon be able to carry out an independent existence. Ozzy’s head has expressed an interest in joining and partly funding the joint Russian/Austrian mission to settle on the Moon aboard Münchhausen I. If the head’s proposal is accepted, Ozzy’s head would become Emperor of the Moon. According to Pravda, no comment was available from Mrs. Osbourne’s head. We gotta save Adam West, he’s serving a very important purpose as mayor of Quahog, RI, home of Peter Griffin! (I’ll let you figure out the reference, if you don’t get it right away.) And Ozzy will be able to continue a happy and productive lifestyle, once we invent the “Futurama” style head jar. Amusing article. Especially the tony martin reference at the beginning. Tony Martin is under appreciated as far as i’m concerned. That song “Hard Life To Love” is the best song ever.